I was a seventh grader slogging through the War of 1812 in history class when my teacher—an admirable woman—noticed my slouching and huffing over a naval battle. I forget which one. That was a nice, honest change from the Official Junior High Teacher Party Line, which held that learning could never be dull. Learning was, always and without exception, as magical as a flying unicorn doing card tricks for an audience of wizards. So they said. I didn’t believe it then, and I don’t believe it now. Everything worth learning has dull bits. When I was brand new to knitting, I wanted to hurry up and work the flashy magic. You know—lace, Fair Isle color work, Aran cables. The stuff that makes you say HOLY WOW from across the room. It took time to understand that it’s often small, unsexy things—selvedges, shaping, finishing—that mark the difference between the good and the great. 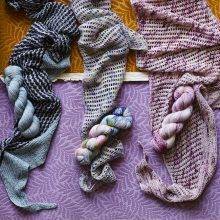 To be the best knitter you can be, it pays to spend time fighting the short, boring battles. 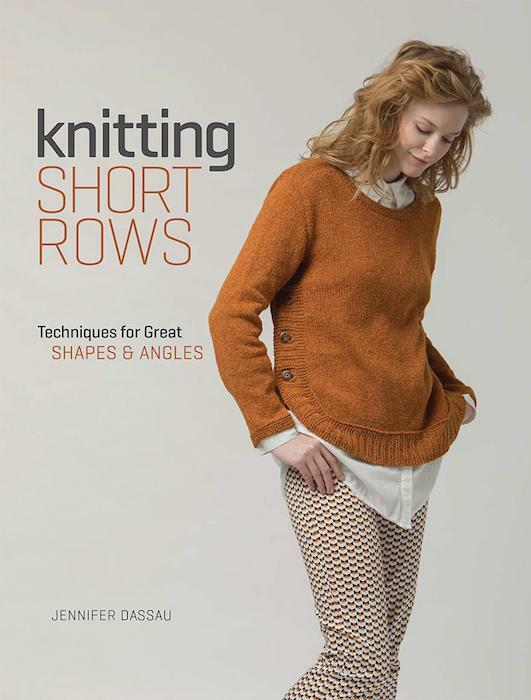 I hesitate to introduce Jennifer Dassau’s Knitting Short Rows: Techniques for Great Shapes and Angles (Interweave Press) with that paragraph, as it might lead you to believe the book is boring. It is not. It is a handsome, useful, much-needed volume dedicated to a subject that doesn’t often get to stand in the spotlight. 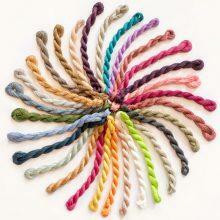 Short rows, like steeks and buttonholes, have been known to give inexperienced knitters the shakes. I’m honestly not sure why, as a short row is nothing more than the name suggests: a row you cease to work before you have reached the end. That’s it. Where the shakes come in, I guess, is that the stopping point is also a turning point. You flip the work and clickety-clickety back in the opposite direction. This turning, left untouched, leads to a hole in the fabric. The various methods that have evolved for working short rows are really about closing up that hole. Well, actually it is. 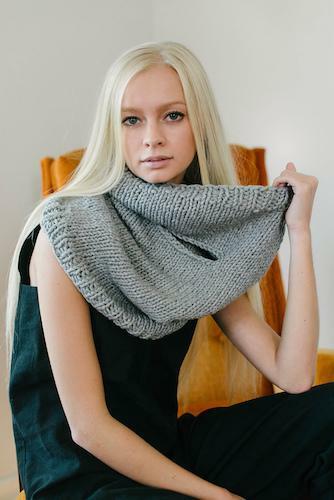 Short rows ought to be recognized as one of the hottest things about knitting—a way of seamlessly shaping the fabric that can be useful (as when raising the back of a sweater neck for a perfect fit), or beautiful (as when shaping a shawl with slow, curvaceous shifts of the grain), or quite often both. Dassau’s book neatly divides the topic into one full chapter per method (Wrap and Turn, Yarnover, German, Japanese, and Twin-Stitch). Each opens with a blessedly thorough step-by-step explanation of the technique, pairing sharp technical illustrations by Kathie Kelleher with equally clear text. There’s no skimping. If the knit and purl versions differ, or the front and back versions differ, space is given to show exactly what must be done. After that, the author dwells for a bit on special considerations for that technique. When does it work especially well? When does it not? Does it play nicely with garter stitch? Texture patterns? 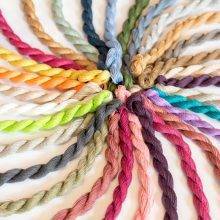 Circular knitting? 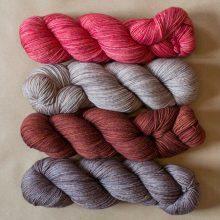 How will gauge or yarn choice affect the finished appearance? Every chapter follows the same format, so it’s easy to compare them side by side, as it were; and see which method is best suited to the piece you’re working on. There’s even a short but informative postlude (easily missed, being tucked away after the final pattern) about substituting one method for another. And oh yes, there are patterns. Seventeen patterns, each aligned with one of the five methods so you can put the theory into practice. Dassau is a clever designer with a penchant for unusual methods of construction. More than one sweater in Knitting Short Rows will elicit the question, “How did you do that?” from half the knitters you meet. It will be your choice whether to explain at length, with much pointing and turning and tracing of invisible lines along the shaping; or only to smile enigmatically as you sip your Old Fashioned. I’m hard pressed to say which sort of patterns I like better—those which show off the effect of short rows or those which use them almost invisibly. In the former camp, the Broken Lines Pullover (knit seamlessly, top down, with simultaneous sleeves, as you do) uses interrupted stripes of garter stitch as clever accents. 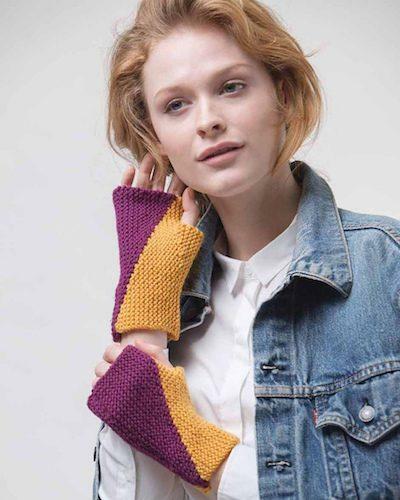 And two projects very different in scale—the big Meeting Triangles Sweater Coat and the tiny Hemisect Mitts—demonstrate the potential of using short rows for modern, bold color blocking. In the latter camp, the Welter Hat looks like it might be just another cute slouch hat—but discreet short rowing means it’ll keep the whole of your neck warm without also burying your eyebrows. This is a great big deal for some of us, who live in cold climates and do not look well without eyebrows. Extra fabric only where you want it. That, in a nutshell, is the magic of short rows. 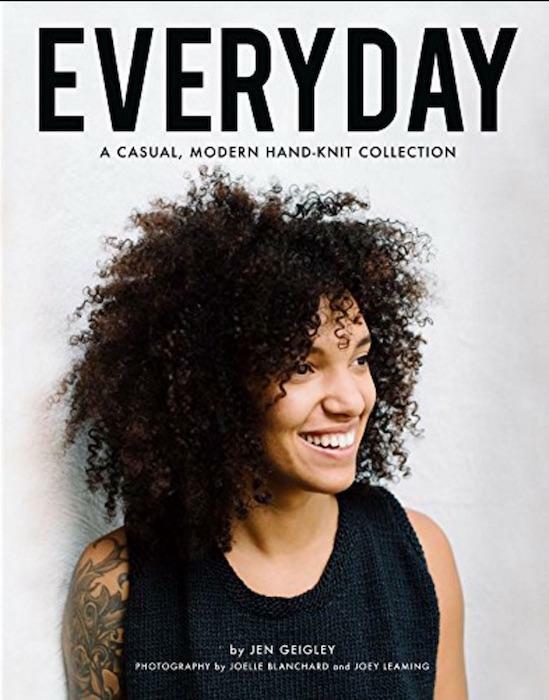 Jen Geigley’s Everyday: A Casual, Modern Hand-Knit Collection (self published) is the sort of pattern book that splits the knit night table in two. Some will roll their eyes, others will place orders for a copy before the first round arrives. Geigley demonstrated in her self-published 2016 collection Weekend: Simple, Modern Knits that very quiet cardigans for the office are not her thing. I don’t know if there’s a commonly held label for her aesthetic, which is minimalist but cozy but edgy but well worn. A friend flipped through my review copy and said (not without a certain . . . tone), “Oh. Portland.” But Geigley’s based in Iowa, so there. Everyday is a capsule collection, a snapshot of the designer’s fascinations at a specific moment in time. Details like solitary, oversized slits (seen in the Moonstone pullover and Eris cowl) recur throughout, tying the looks together. In Everyday, as in Weekend, there’s a lot of playing with scale. Super bulky yarns are much in evidence, often as cowls (like Gwen) and mitts (like Chill) that some will find overwhelming or just plain silly. I’m more inclined to appreciate the way they envelop the body like armor—protection against either bad weather or just a bad day. The outré gauge is part of the fun. 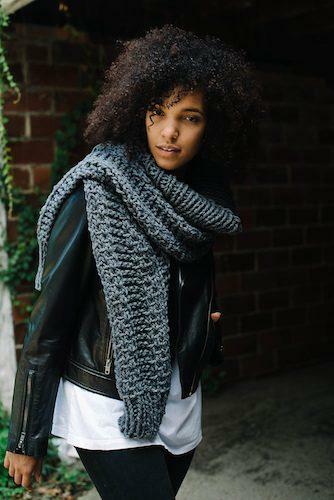 If you’re knitting up the chunky Zero Tank, you’re probably as interested in playing with silhouettes and layers as you are in keeping warm. It’s dressing up (or down) as art. 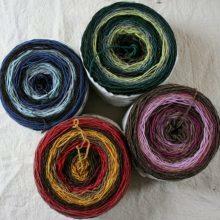 That collections like this are appearing on the scene is, I think, a sign of the knitting world’s health and vitality. If a craft is to flourish, it has to be adaptable—appealing and useful to the broadest possible spectrum of practitioners. Some knitters like very quiet cardigans, and they should have them. 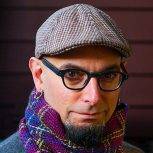 Some knitters will like Everyday, and they should have it. We’re a big table, with room for everyone. Scoot over. Photos from Knitting Short Rows by Jennifer Dassau. Photos from Everyday by Jen Geigley. Entertaining as always, definitely not boring our Franklin. His interesting comments tend to make me look longer and with more interest at the pictures. Tagging on here because I can’t have say it any better Kim! And a great big smacky Thank You Kiss to Franklin for always bringing a smile to my face. Which at this moment in time, I surely needed. Hearts. Many apologies typing assist got the better of the spelling of your name and I missed it. Ick. Why didn’t anybody say that before? ” . . . or only to smile enigmatically as you sip your Old Fashioned.” I love you, Franklin. I’m a technique fan. Clearly the first book belongs in my library. Thank you for bringing it to my attention AND for making it intriguing. For an English Major/Knitter, MDK has forever satisfied my penchants for a well-turned phrase and an equally well-turned heel. 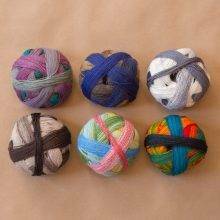 Franklin’s reviews are icing on the cake-yarn,naturally. Thankyou Franklin for these insightful and entertaining reviews of books highlighting such different aspects of the knitting universe. I went promptly to my library’s website and place a hold on the Short Rows book (all copies already in use!) before I’d even finished the second paragraph of your review. Sounds PERFECT. I never buy a book before trying it at the library, but there could well be a copy of my own on my book shelves soon. Amazing – a book on the Basics which doesn’t re-hash the same old stuff or talk down to you. I think this book will be on my “must have it” list. Thanks, Franklin Habit ! Franklin, Your writing pulls me in every time. Intelligent, humorous, clear, informative, delightful with style and panache – what more could a reader want? Keep doing what you’re doing.